HTC has posted the long-awaited - and much promised - Android 2.1 update for its Hero smartphone. Early online reactions suggest the installation process is neither as smooth nor as quick as it might be, but once past the system hangs - real and seemingly so - your Hero will emerge with the latest version of Google's OS. At least until Android 2.2 becomes ready for primetime. 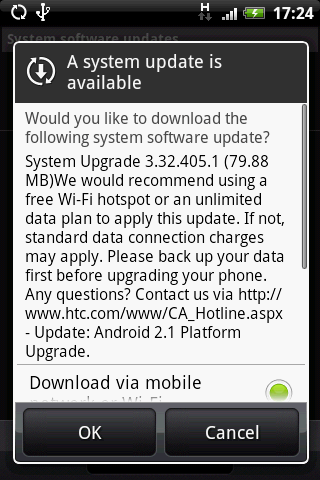 How long will it take HTC to release an update for that, we wonder? The Hero's Android 2 update was first promised for February. In the meantime, there's 2.1 - which also works on Orange-tied Heroes, online forum posters have claimed.